No time can ever have been an easy one for a professional painter, but the early twentieth century was more turbulent than most. If an artist did not reinvent and restyle their work every few years, they risked being dismissed as outdated. 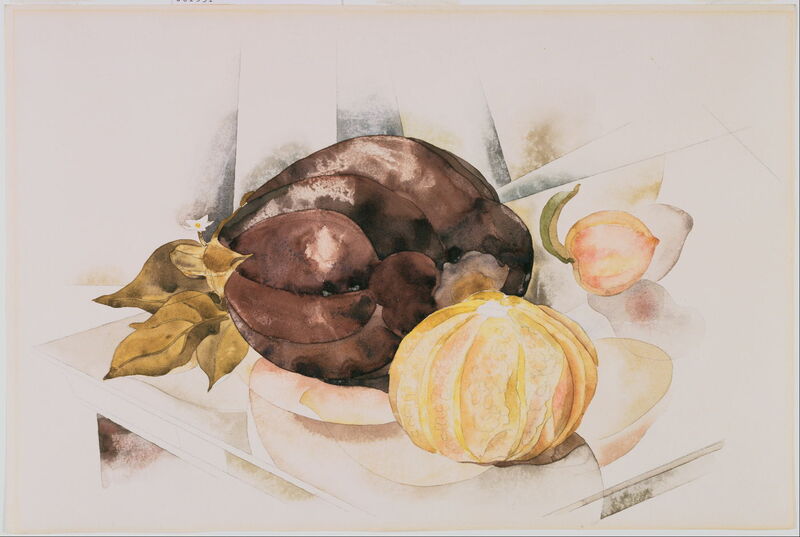 But some seemed to do that anyway, particularly Charles Henry Buckius Demuth (1883–1935). He was born and – when in the US – remained in Lancaster, Pennsylvania. He first trained at Franklin & Marshall Academy, then at Drexel University, before going on to the Pennsylvania Academy of Fine Arts, where he was taught by William Merritt Chase. He first travelled to Europe in 1907, and studied at the Académies Colarossi and Julian in Paris, where he engaged in the avant garde art scene and its tolerant attitudes. When in Paris, he became close friends with Marsden Hartley, who later introduced him to Alfred Stieglitz, who promoted his work. He continued to visit Europe until 1921. However his health was never good: he walked with a limp, and became an insulin-dependent diabetic, one of the early patients to be given insulin injections when they were introduced. Charles Demuth (1883–1935), Flowers in Field (c 1907-8), watercolour, 38.1 x 28.9 cm, Private collection. The Athenaeum. 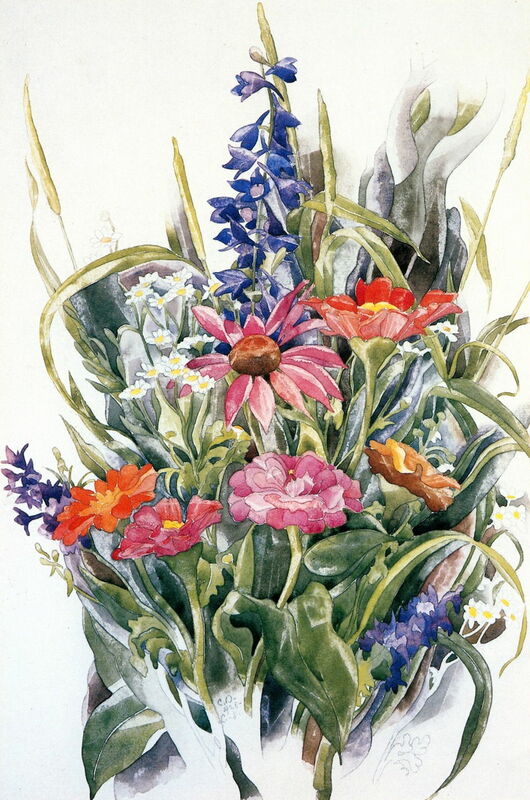 Throughout his career, one consistency in Demuth’s work are his flowers. They started quite simply with his Flowers in Field (c 1907-8). 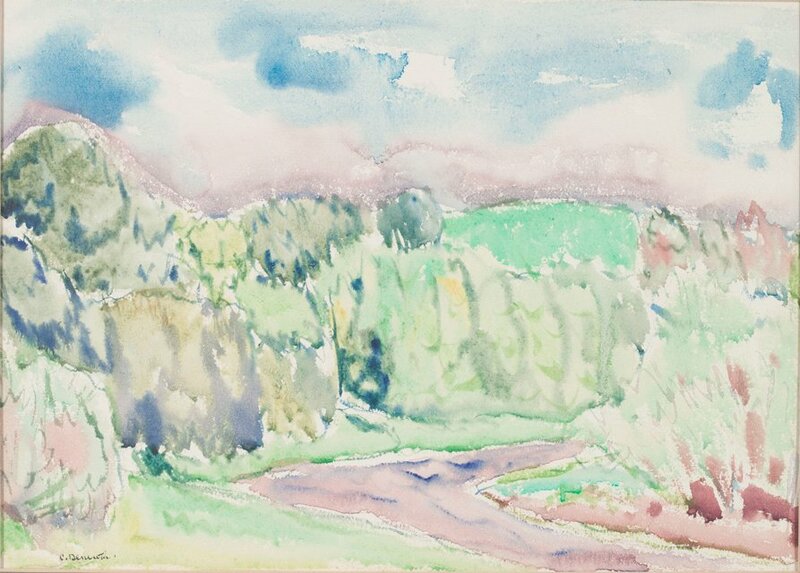 Charles Demuth (1883–1935), Landscape (date not known), watercolor, 24.1 x 33.7 cm, The Demuth Museum, Lancaster, PA. Wikimedia Commons. Although undated, I suspect that his Landscape was also painted during his early time in Paris, or shortly after. 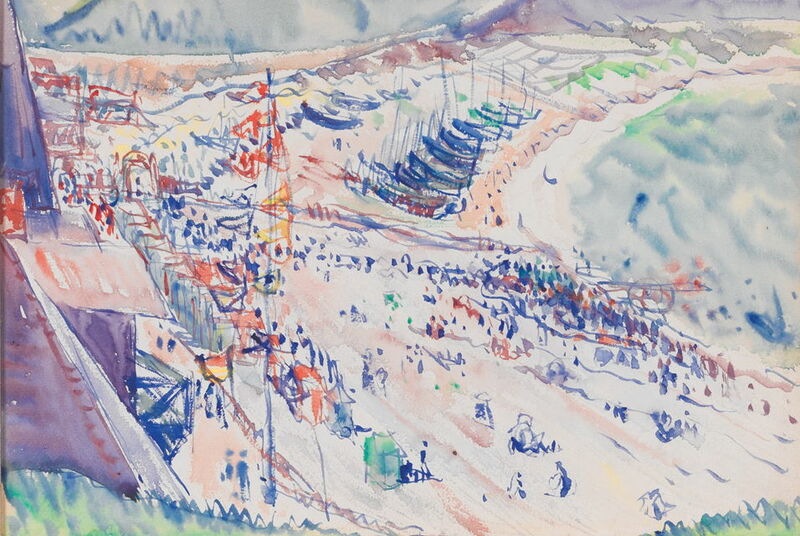 Charles Demuth (1883–1935), Beach at Étretat (c 1913), watercolour, dimensions and location not known. Wikimedia Commons. He also painted a couple of views of beaches in the summer, in France, including his Beach at Étretat (c 1913). Both are very sketchy in style, the people shown almost as annotations rather than forms. Charles Demuth (1883–1935), Rocks and Sea (Coastal Scene) (c 1912-15), oil on board, 30.5 x 40.6 cm, Private collection. The Athenaeum. Demuth painted largely in watercolour during his early career, but he did use oils occasionally over this time. 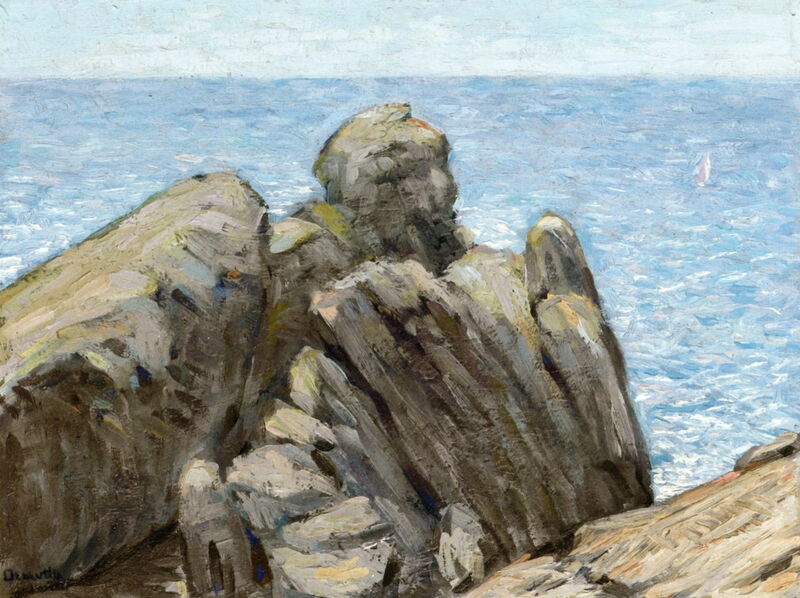 His Rocks and Sea (Coastal Scene) (c 1912-15) is one of his earliest oil paintings, and was probably painted when he was living in Paris between 1912-14. 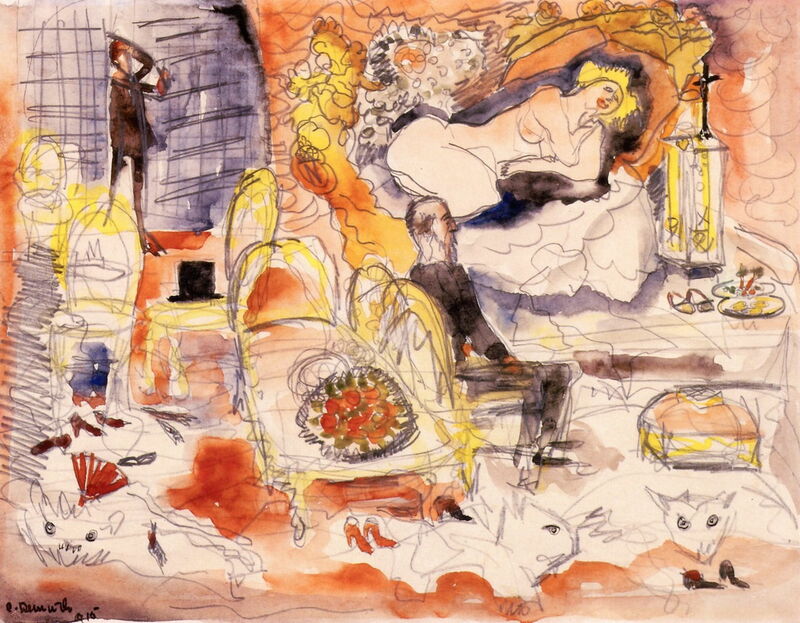 Charles Demuth (1883–1935), Count Muffat Discovers Nana with the Marquis de Chouard (1915), watercolour, pencil, pen and ink on paper, 21.6 x 27.8 cm, The Barnes Foundation, Philadelphia, PA. The Athenaeum. In 1915, Demuth started to paint series of watercolours showing scenes from his favourite literary works, including Émile Zola’s Nana, and Henry James’ The Turn of the Screw. Count Muffat Discovers Nana with the Marquis de Chouard (1915) shows a scene from the former and, like his other paintings of literature, is narrative. 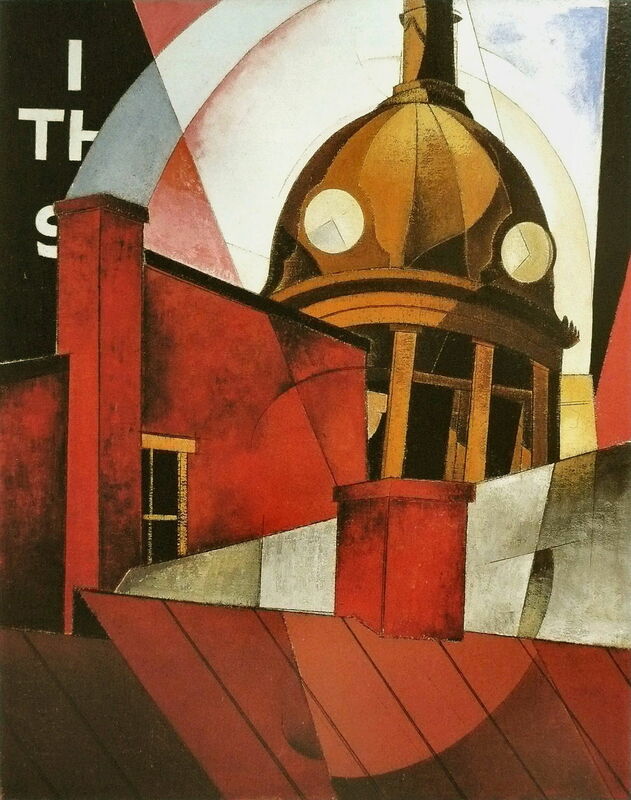 At this time, Demuth was becoming a major figure in the nascent Precisionist movement, together with Georgia O’Keeffe and Charles Sheeler. Less evident in the watercolour above, his works started to depict a narrow range of forms in a sharply-defined manner. His landscapes (cityscapes, to be more precise) lack figures, are highly structured, share settings of similar theme (in Demuth’s case, the industrial), and exhibit sharply linear geometry. Following his experience in Paris, Demuth engaged in New York’s café society, and new entertainments such as The Jazz Singer (1916). 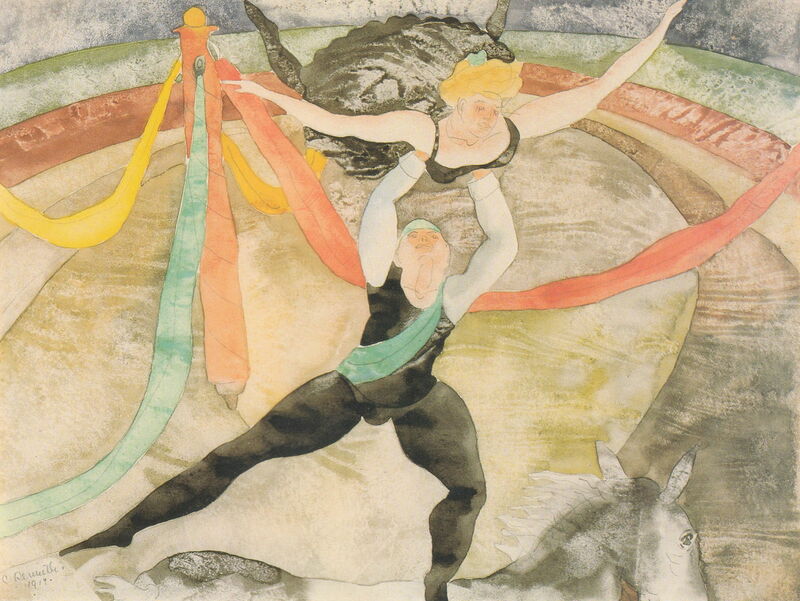 The Circus (1917) was one of another series of watercolours which he painted of acrobats and circus scenes, which also absorbed him. 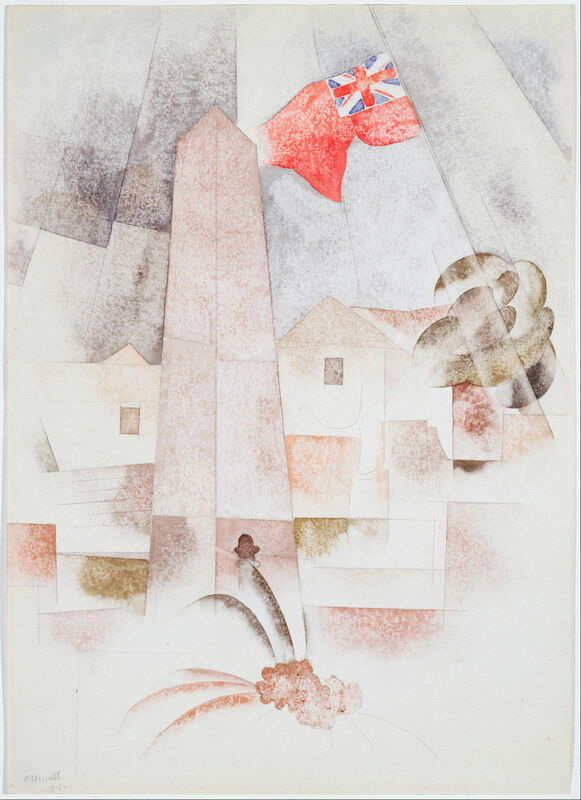 Although the geometry in Precisionism was influenced by Cubism, Demuth only ever showed Cubist tendencies, as in his Monument, Bermuda (1917). 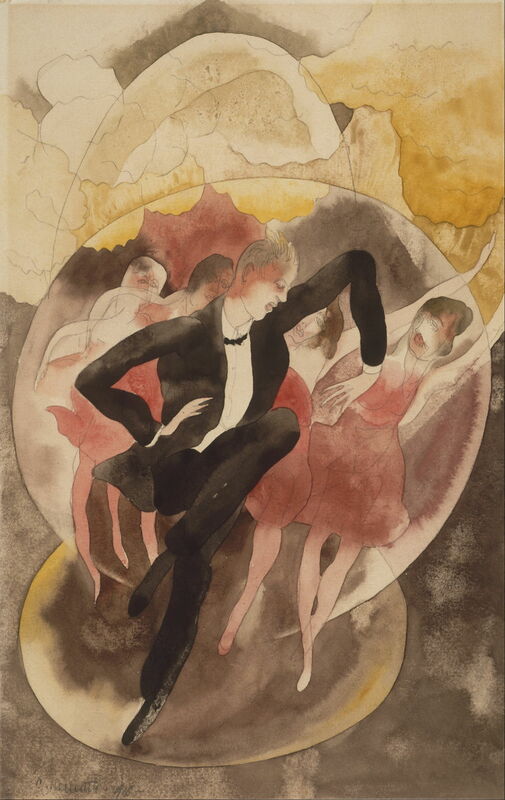 Charles Demuth (1883–1935), In Vaudeville (Dancer with Chorus) (1918), watercolor and graphite on off-white wove paper, 33 x 20.7 cm, Philadelphia Museum of Art, Philadelphia, PA. Wikimedia Commons. 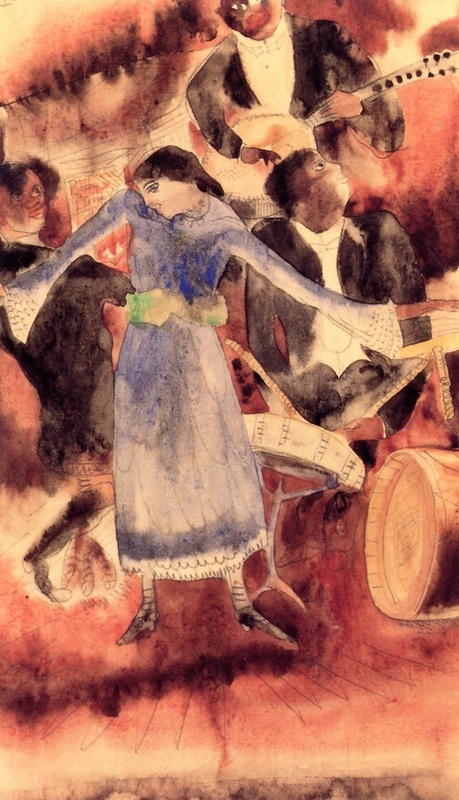 In Vaudeville (Dancer with Chorus) (1918) is another painting derived from time spent enjoying the night-life in clubs. 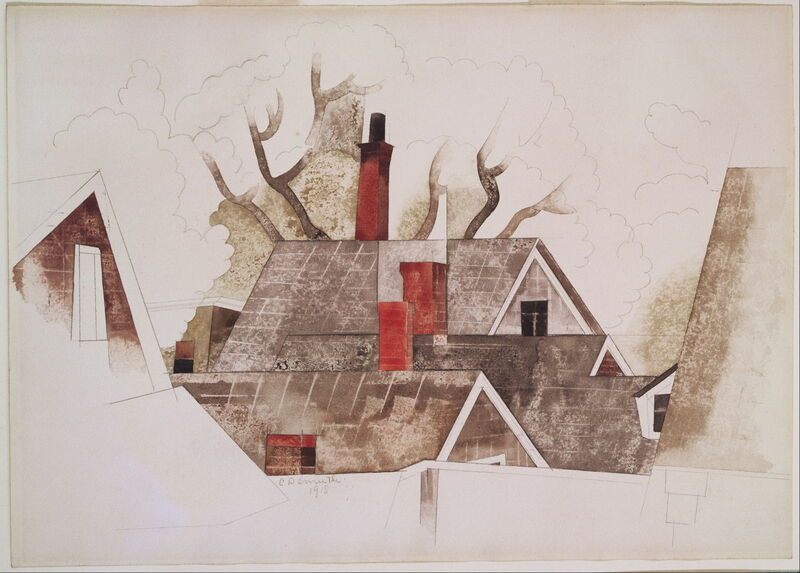 Charles Demuth (1883–1935), Red Chimneys (1918), watercolour and graphite pencil on medium-weight medium-textured off-white wove paper, 10.1 x 14 cm, The Phillips Collection, Washington, DC. Wikimedia Commons. Red Chimneys (1918) demonstrates his maturing Precisionist style, with its Cubist relations, but quite different from Cubism. Charles Demuth (1883–1935), Modern Conveniences (1921), oil on canvas, 65.4 x 54.3 cm, Columbus Museum of Art, Columbus, OH. Wikimedia Commons. In 1919, he started painting a series of Precisionist landscapes/cityscapes in oils, which he continued intermittently until 1933. 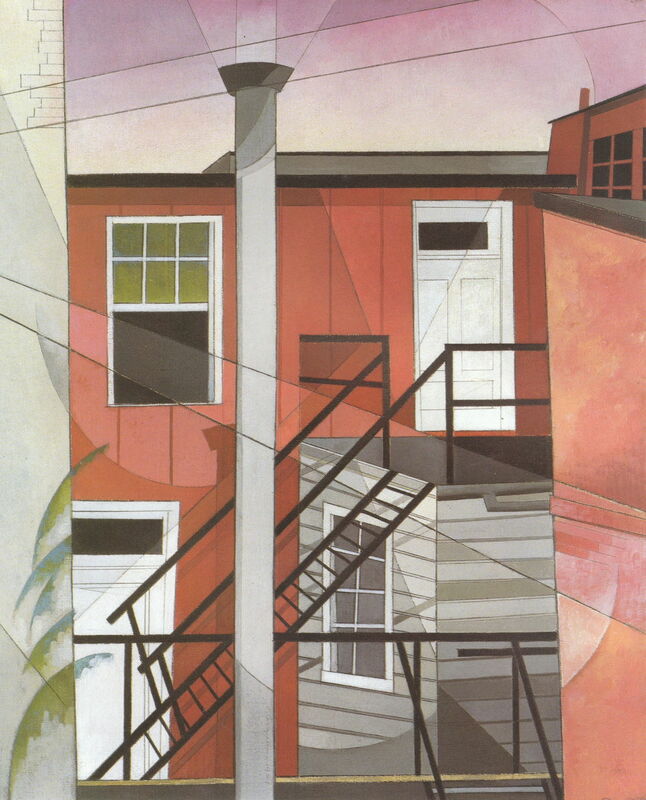 Part of that series, Modern Conveniences (1921), is based on the rear view of a building close to Demuth’s family home in Lancaster. Charles Demuth (1883–1935), Welcome to Our City (1921), oil on canvas, 63.8 x 51.1 cm, Terra Foundation for American Art, Chicago, IL. Wikimedia Commons. Welcome to Our City (1921) is also markedly Precisionist, its glimpsed and fragmented text suggestive of his later ‘poster portraits’. 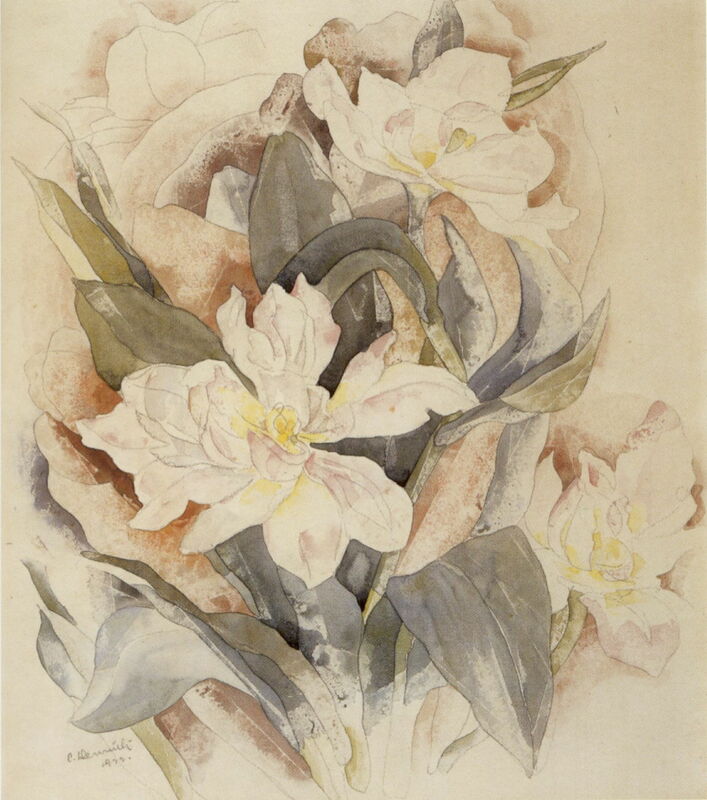 Charles Demuth (1883–1935), Flower Study (1922), watercolour and graphite, dimensions not known, Honolulu Museum of Art, Honolulu, Hawaii. Wikimedia Commons. He had never entirely given up painting flowers, and in the 1920s they came to dominate his work. Reflecting his changed style in landscapes, these were now detailed botanical paintings, as in his Flower Study (1922). He not only painted flowers, but fruit and vegetables too, including his favourites Eggplant (c 1922-23) – the aubergine. 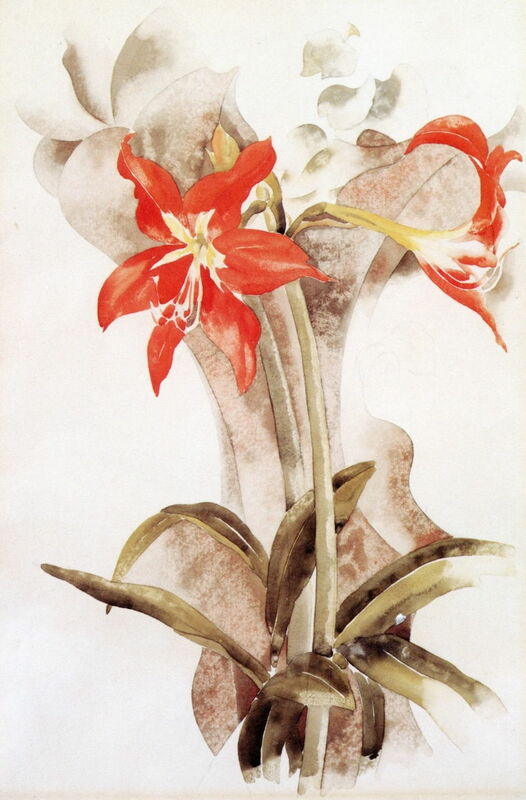 Charles Demuth (1883–1935), Amaryllis (c 1923), watercolour on paper, 45.7 x 30.5 cm, Cleveland Museum of Art, Cleveland, OH. The Athenaeum. Like several of his other floral works, Amaryllis (c 1923) was painted when he was recovering from acute complications of his diabetes, which was diagnosed in the early 1920s. As those episodes became more frequent, so he more often returned to the solace of his flowers. In 1926, he had solo exhibitions in two New York galleries, from which he enjoyed considerable success. Charles Demuth (1883–1935), Zinnias, Larkspur and Daisies (1928), watercolour on paper, 44.5 x 29.2 cm, Private collection. The Athenaeum. 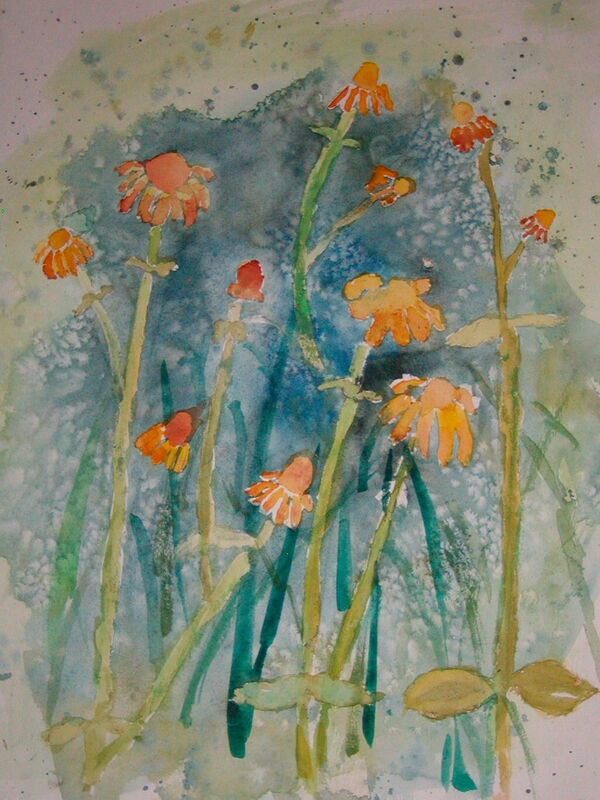 Zinnias, Larkspur and Daisies (1928) is another of his exquisite floral watercolours. 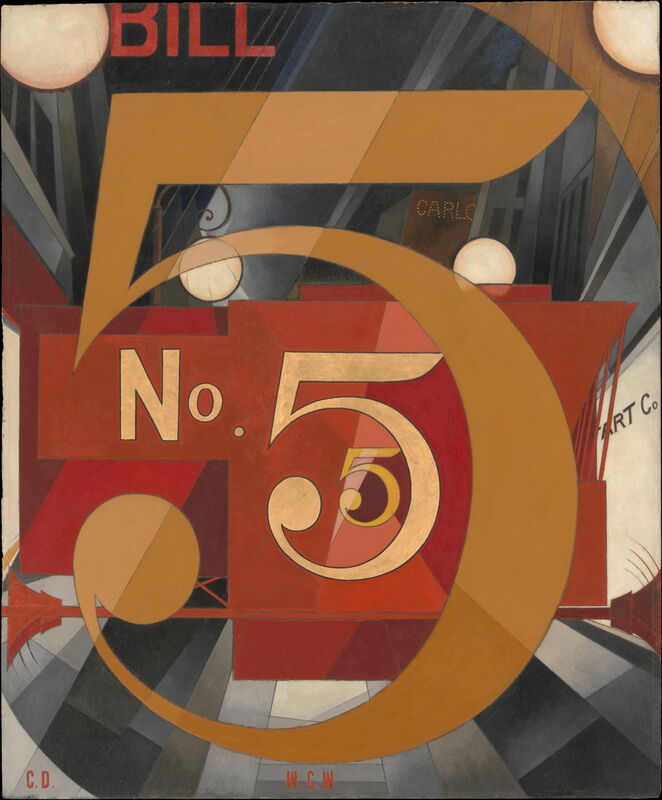 Charles Demuth (1883–1935), I Saw the Figure 5 in Gold (1928), oil, graphite, ink and gold leaf on paperboard, 90.2 x 76.2 cm, The Metropolitan Museum of Art (Alfred Stieglitz Collection, 1949), New York, NY. Courtesy of the Metropolitan Museum of Art. Between 1924 and 1929, he painted eight or nine tributes to friends and other modern American artists, and those associated with the arts. These were dedicated to Georgia O’Keeffe, Marsden Hartley, Gertrude Stein, Eugene O’Neill, and others, with his I Saw the Figure 5 in Gold (1928) for the poet and physician William Carlos Williams. Demuth and Williams had been close friends since their student days. The imagery here is derived from a poem, The Great Figure, by Williams, which evokes the sensations of a fire engine racing down a street. Coincidentally Williams first conceived of the poem when he was waiting for Marsden Hartley. 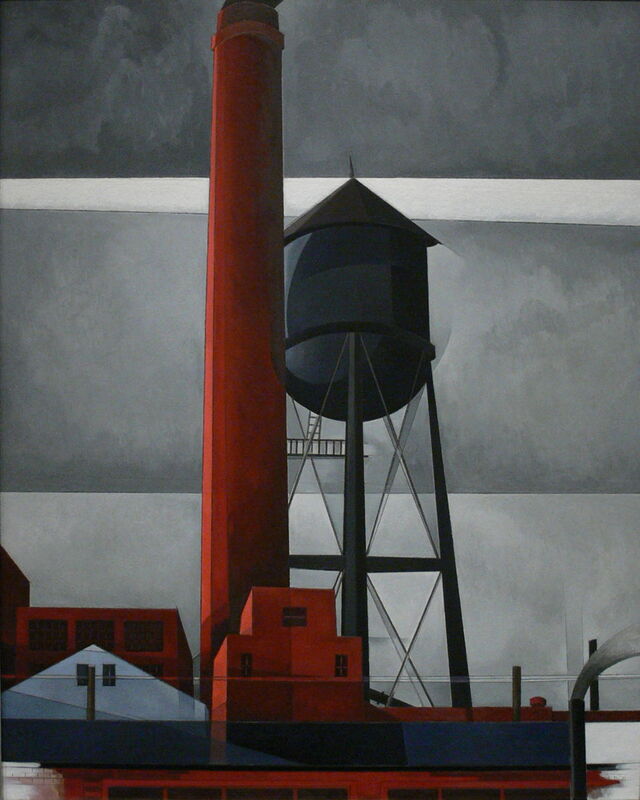 Chimney and Water Tower (1931) is one of a late series of seven Precisionist paintings depicting factory buildings in Lancaster, which he completed in 1933. It is quite possibly his best-known painting, and states the Precisionist manifesto most eloquently. Demuth died in 1935 of the complications of diabetes. Posted in General, Painting and tagged botanical, Chase, Cubism, Demuth, floral, Hartley, O'Keeffe, painting, Precisionism, Sheeler, Williams, Zola. Bookmark the permalink.